The first regional summit meeting of the South Central United States was held during the Lone Star State Dive & Travel Show in Frisco, Texas. 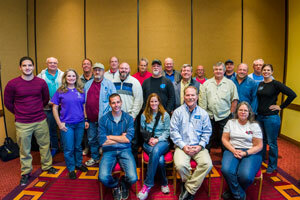 Twenty One (21) Dive Industry Professionals attended, representing dive stores, dive boats, dive clubs, dive instructors and various dive businesses. This is one Man’s summary of the discussions that were held at the Summit. If I missed something, please add to this. We are looking for active engagement. If you have a store, boat or club, you have been listed on the DIVE LOCAL Directory on our Blog. If we missed someone, please let us know. Thank you. Rick Stratton, Dive News Network kicked off the program by explaining the concept behind the Regional Summit Meetings. Why it is important to promote local diving. Gene Muchanski, Dive Industry Association, Inc: Talked about a shared industry campaign, DIVE LOCAL, and what it is trying to accomplish. Gene said that, “Promoting the diving industry to the general public is a shared responsibility of all actively engaged Dive Professionals. We must all do our part to grow the recreation.” DIVE LOCAL defines the Local Diving community as Dive Stores, Dive Boat Operators, Dive Clubs, Dive Instructors and Local Resorts where applicable. The sectors of the Diving Industry that have the most to gain from the promotion and success of the Local Diving Community is the; 1) Certification Agencies that sell certifications. 2) Manufacturers that sell dive equipment. 3) Travel Businesses that sell travel trips. Therefore, they should be sponsoring DIVE LOCAL and providing co-opt advertising dollars to the campaign. The message we want to send to the general public is 1) Learn to Dive. 2) Buy Your Gear. 3) Go Diving. 4) Stay Active. Eric Peterson, Scubapro Regional Sales Manager: Local Texas Diver talked about Dive Around Texas and what it did for the local economy. The program ran for six years and in the fifth year included DEMA’s Dive Caching. One activity gave away a grand prize of $1,000. Looking for local new ideas. Both of the groups focused on potential solutions to growing the local dive community rather than fixating on problems and challenges. There was some conversation about the current dive leaders not taking the younger generation seriously enough and not respecting them for their accomplishments. We had a brief discussion about Internet Sales and concluded that internet sales at a dive store is one type of business model. Stores either choose to use that method or they don’t. We discussed the importance of relationships with our customers and treating our employees and staff as future leaders in the industry. We agreed that diving activities are the lifeblood of a local diving community but there was little discussion how dive professionals communicate their planned activates to their customers. The group would like to see more collaboration between stores and clubs. Youth activities are a great way to promote diving to young people. One group should be age 8-17 and a second one from age 18-29. It works well for churches, why not diving? Teaching diving at Colleges & Universities grows the industry and supplies us with young divers. There is much opportunity at local colleges to teach scuba diving. Promote relationships – Trust & respect – Be the white knight ! Communicate with your customers. How? Promote Social Aspects of Diving / personal / fun / relationships – promote events. Can stores help with club events? Ways to improve the economic impact of the local diving community. We need to establish a base line of where we currently are financially. How many stores, boats, clubs and instructors are in the Greater Texas area? Who promotes diving the most and what media do they use to get the message to the public? How many active divers are there in the South Central? Where do they dive and how often? We need complete contact information on dive Stores, Dive Boats, Clubs and Instructors. This entry was posted in South Central U.S.. Bookmark the permalink.